Two yellow streamers formed an equals sign in the dean’s door frame. No one told me it was his birthday. The news might have been in one of the e-mails I deleted without opening. With the constant threat of staff eliminations, it seemed like a good idea to check the door for a card and add my signature. I got a few inches from his door. My eyesight is bad. Legally blind is one way to put it. It’s not how I like to put it. Beneath the name plate of Randall “Scoot” Simkins, PhD, there was only the homemade poster telling visitors, “This door is actually open (metaphorically)! Come back soon!” I didn’t like metaphors. I knocked twice above the top streamer. The dean and my colleagues were upstairs at our daily meeting for which I was ten minutes late. I reached between the streamers, opening the door in the literal sense. Campus theft and vandalism had been on the rise, and Simkins adjourned every meeting with a reminder to lock our office doors. Only two of us had office doors. The knob turned. That he treated his own words with the same indifference as his faculty made me a little sad. I said his name again, waited three seconds, and limboed inside. The odor of rotten eggs overwhelmed the urine and black mold that were Parshall College’s unofficial scents. One time, a colleague brought me into her classroom to examine the sulfurous aroma, to determine if it was one of the ghosts some blamed for the school’s decline. The visually impaired have certain skills, like knowing when another person is in the room with us, that lend us a certain credibility in matters of the supernatural. I had placed an ear against two walls of the classroom and nodded ambiguously. Three steps into Simkins’s office, something crunched under my shoe. The carpet held shards of plastic the size of fingernails. Some were wet. I sniffed my finger, found the source of the stench, and coughed my way to the window. “Dr. Cowlishaw,” whispered someone on the ground outside the broken window. I had an MBA, not a doctorate, but didn’t correct students who conferred on me the additional degree. “There he is.” I recommend this greeting, even to the fully sighted, when you have no idea who you’re talking to. From where I stood, I made out a blue coat, one arm waving beneath the leafless tree. To be precise, I have central blind spots, leaving the rim of my peripheral vision my only useful eyesight. “Why are you in Simkins’s office?” whispered the voice I now recognized as Wade Biggins. Wade’s time at Parshall more than doubled my own five years. His inane, mostly sincere questions derailed many a lecture and class discussion. Some students had come to regard him with ironic reverence, the faculty with something between fear and existential heartburn. “It’s the dean’s birthday, Wade. I’m decorating his office.” I leaned in close to the shattered pane and placed a finger across my lips. Fixing the broken windows, we had voted last year, would only encourage more vandalism. “Make sure he gets my present,” Wade said. “Stink bomb!” he shouted before running away. Footsteps in the ceiling reminded me why I was here. Between the dean’s computer monitor and a chipped Parshall mug filled with pennies sat the memo holder on which Simkins impaled coupons for fast food. I freed the one on top and got out my magnifier, the 22X loupe that makes some reading possible. Free six-inch sub with the purchase of a six-inch sub. I slid it in my back pocket. They didn’t pay me much. I lifted the lid of the glass candy dish he kept filled with circus peanuts. The smell was vaguely floral, vaguely astringent. I gave one a squeeze and put it back. Stiff as they were, they might have been the same ones Simkins offered me five years ago along with my job. A Post-it in the center of his desk read “a Butter.” The birthday card was nowhere to be found. A heavier set of footsteps thudded overhead, possibly in the stairwell. Fearing they were those of my lumbering dean, I crouched behind the black file cabinet. My knees were exposed. I crawled under the desk, from which vantage it became clear the footsteps didn’t belong to Scoot Simkins. Scoot’s feet, along with the rest of him, lay on the floor behind his chair. The footsteps faded. I said hello, a feeble uppercut at the overgrown silence. I knew what I’d find, or wouldn’t find, before I checked his cold wrist. Like I said, I know when I’m alone in a room. The dean’s flaccid body was firmer than it had any right to be. That Randall “Scoot” Simkins had left the world on the same date he entered it lent a degree of nobility to his life. He meant well, his faculty would say at his funeral. One of us might believe it. The dean had no wife or children, and I tried to think of anyone who might miss him. Most faculty, myself included, often joked of ways we might take revenge on the man who increased our work load at the same steady rate he cut our salaries. Just last week someone proposed training a fire hose on a certain orifice with which our dean shared so many characteristics. Something glinted in the corner of my eye. Everything I see is in the corner of my eye. Simkins’s hand curled around an old school, all-metal stapler. A shadow darker than most shadows ran from Simkins’s head to the wall. I touched it the way I do when things seem like an optical illusion. The shadow was sticky. I brought my face a few inches from the dean’s. It was one of only a few good looks at him I’d ever had. A few looks are all you need. Most of the time voices tell you everything you need to know, but Simkins wasn’t saying much. His hair smelled of women’s shampoo. He must have had a coupon. Scoot had the jowly face of an offensive lineman, the pretense of toughness undermined by features so soft they might have been drawn in crayon. A wattle the size of a generous meatball made its home beneath his stubbly chin. I pulled on it. Scoot’s head crackled a little as it left the carpet. If I weren’t looking for them I wouldn’t have seen the three spots on the top of his head, a little darker than the rest of his blood-dark hair. The spots were equal in size, slightly bigger than the tip of my smallest finger. I pushed down on the stapler in the dean’s hand, confirming staples were all it held. I would have been impressed if he had shot himself three times in the top of the head. It would have been the first and last time he had ever impressed me. I was a little dazed. I might have stood up too quickly. I might have had an aversion to dead bodies. I called off the search for the birthday card in light of what I had already found. More footsteps in the ceiling reminded me where I was supposed to be, where Dean Simkins was supposed to be. Slowly I opened the door, my hand brushing against the birthday streamers, which weren’t made of paper but tightly stretched plastic. Letter by letter I read the words, which did not spell happy birthday. In the stairwell, I opened the face of my watch and felt the minute hand. Seventeen minutes late. Londell Bakker’s soft baritone barely carried into the hall. Two years ago, during the flu scare that never reached Grayford, we voted Londell third in command behind Simkins and his assistant dean, Delilah Bibb. Rounding the last aisle of desks, I passed Delilah’s wheelchair. She was the only one crying as far as I could hear. “Tate, I don’t know if you saw the police car outside.” Londell handed me a copy of the agenda, which I scrutinized with my eyes in a left to right facsimile of reading. Most of my colleagues knew the extent of my impairment, but I rarely passed up a chance to seem normal. Silence lasted ten seconds while the room honored her request. “Will he be able to read it?” asked Benjamin Tweel. “I think he will,” I said. Delilah wept. The rest of us—eleven if we were all there—didn’t make a sound. Outside the building, a car door closed. “I’m sure our students, like us, will want some time to grieve.” Londell Bakker was a half-black, half-Scandinavian professor of what we called “Societal Studies” with dreams of becoming a stand-up comedian. Nothing he had ever said onstage was as funny as the thought of our students, or the faculty minus Delilah Bibb, shedding a tear for someone who insulted our intelligence more frequently than we thought was legal. A tiny breeze rattled the aluminum blinds. A door creaked on the first floor. Someone started up the stairs. None of my colleagues seemed worried. I followed their lead. Not worrying had come naturally since I was sixteen, the age my optic nerves announced their early retirement. Because danger might forever lurk beyond my meager sightline, I had to decide whether to worry constantly or never at all. The latter seemed like less trouble. The hard-soled shoes clicked into the classroom. “Good morning,” said our darkly clad guest speaker. “Maybe not for what’s ‘is name, I guess. Anyway, I won’t keep you as long as I understand he would have.” He laughed in the deeply satisfied way that doesn’t invite you to join in. Duncan Musgrove joined in. “I like this guy,” Duncan said. “Excuse me, officer.” Delilah located her voice beneath a sob. “We’ll let you know what we know when we know it. In the meantime, I’ll let you fine educators tend to your pressing matters while I give your dean a lift to the morgue.” Detective Stashauer approached Mollie’s desk and picked up what must have been the agenda. “Think, pair, share ideas for Conference on Interdisciplinary Assessment.” The words were stretched by his expanding smile. Silence seemed to serve as a yes. As much as we resented Scoot Simkins for the power he held over us, his talent for ruining days with never-ending meetings, and his passion for paperwork, he also had been our advocate to the school’s trustees, the secretive group who authorized our paychecks. Small as the paychecks were, there were always adjuncts, numerous graduates from the state university across town, willing to work for even less. Co-coordinator of the writing course with Mollie DuFrange, Carly Worth was a nervous blonde who spoke at meetings more sparingly than I did. She cleared her throat. “I sold my novel,” she said, sounding embarrassed. Carly’s was a pretty voice, something you’d keep on a high shelf so kids couldn’t break it. “Congratulations,” I said and clapped slowly, giving others the chance to join in. No one did. To honor the memory of our late dean, we decided to, in the words of Delilah Bibb, “put our students first.” My own students, as usual, expressed their disappointment upon seeing me enter Suddreth Hall. I wasn’t much of a teacher, as Simkins liked to tell me during my annual reviews, and I didn’t disagree. I was a box-checker and gatekeeper of the industrial complex. I taught financial literacy and rudimentary math, courses deemed practical enough to remain in the curriculum, which Simkins revised each fall after returning from another conference on the depressed campus of a small Midwestern college. Past the fog of urine stretching around the corner from the men’s room, Carly Worth said my name. “It’s Carly,” she added in that soft, far-right-side-of-the-piano voice. “I see that,” I said. I knew it was her as soon as she spoke. Friendly gestures, like people I knew telling me who they were, always struck me as condescending. This might have been why I had few friends. Carly shushed me as a pair of students filed past us into her classroom. “They know it’s a mediocre school,” I said. “Ask them. Carly got close enough for me to see her smile if I glanced a foot above her head. It’s nice sometimes to see such things, however briefly, before returning to the art of feigned eye contact. Her mouth was very close to my ear, presumably to tell me something, when the student seated closest to the door started laughing. Wade Biggins was not what we used to call “college material.” At this point, neither were most of his peers. He had an unhealthy penchant for mischief, a mild form of autism, possibly undiagnosed, and a future no brighter than a sock drawer slammed tight-shut. Even so, the odds that he had killed the dean seemed remote. One would have to progress from stink bombs to bullets, it seemed, and not the other way around. In addition to teaching duties, I was also required to patrol the campus twice a month, performing what could nominally be referred to as rituals. When Simkins felt a meeting had not lasted long enough, he called on me for an update on the college’s paranormal health, and I would describe what I had “encountered” on my most recent tour. With no teaching experience prior to this job, my hire came directly at the behest of F. Randolph Parshall, trustee and grandson of the school founder. In his expert, possibly senile assessment, I had a singular ability to detect and communicate with apparitions, the displeasure of whom, Parshall believed, was causing the decline of our quaint school. Carly had a laugh that made me want to cancel class. Many things had this effect on me. She said she’d call me and disappeared inside her classroom. “Does this count for a grade, Dr. Cowlishaw?” One of the ashleys wanted to know. I was passing out the exams and bubble sheets Simkins had placed in our boxes the week before. Nearly half of all instructional time consisted of tests to obtain data, longitudinal studies simkins used to measure the efficacy of whatever we were or weren’t doing. “I took this in another class,” said one of the Brittanys. “Just do the best you can,” I said in response to both questions. Ten minutes had gone by when someone knocked on the classroom door. I carried one of the tests to the door. The individual made no efforts to come in. He was the size and shape of a twelve-year-old boy. He gave the exam a once-over and handed it to the much taller figure to his right. “Are you Cowlishaw?” asked the short one. “I am. Who are you looking for?” I stepped aside to invite them in. “Can we have a word with you in the hallway?” asked the taller one whose voice I recognized as Detective Stashauer. He placed the exam in what sounded like a Ziploc bag. I turned the truth over in my mind. I didn’t like how it felt. Before I could think of an alternative, I felt the taller detective’s hands around my arms. He spun me around, held my cheek against the wall. His partner, I presumed, in a gentler but no less decisive manner, fitted my wrists with cold metal. 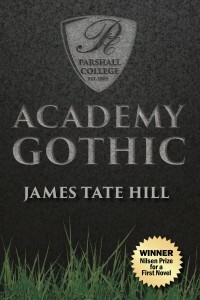 JAMES TATE HILL’S debut novel, Academy Gothic, won the 2014 Nilsen Prize for a First Novel and was published in 2015 by Southeast Missouri State University Press. 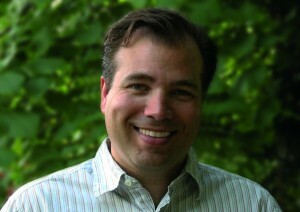 He is Fiction Editor and Book Reviews Editor for Monkeybicycle and lives in Greensboro, North Carolina with his wife, Lori. Find out more at his website or follow him on Twitter. Adapted from Academy Gothic, by James Tate Hill, Copyright © 2015 by James Tate Hill. With the permission of the publisher, Southeast Missouri State University Press.